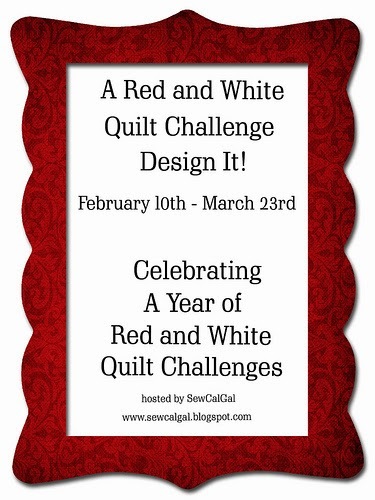 SewCalGal is hosting a Year of Red and White Quilt Challenges throughout 2014. There are several different phases of the challenge. She began with a virtual quilt show of red and white quilts. 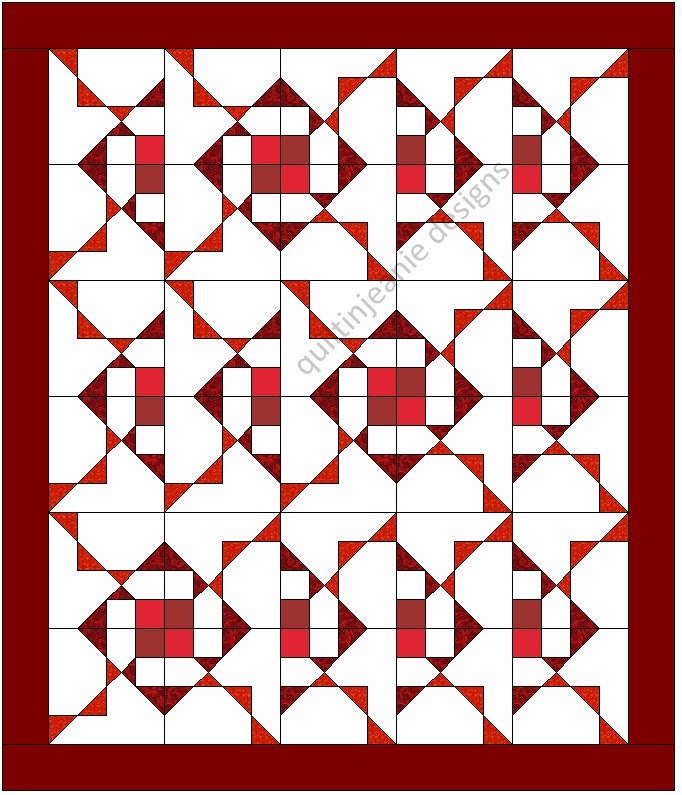 The next phase is a design challenge which I decided to enter because I rarely use red and I like the idea of a two color quilt. 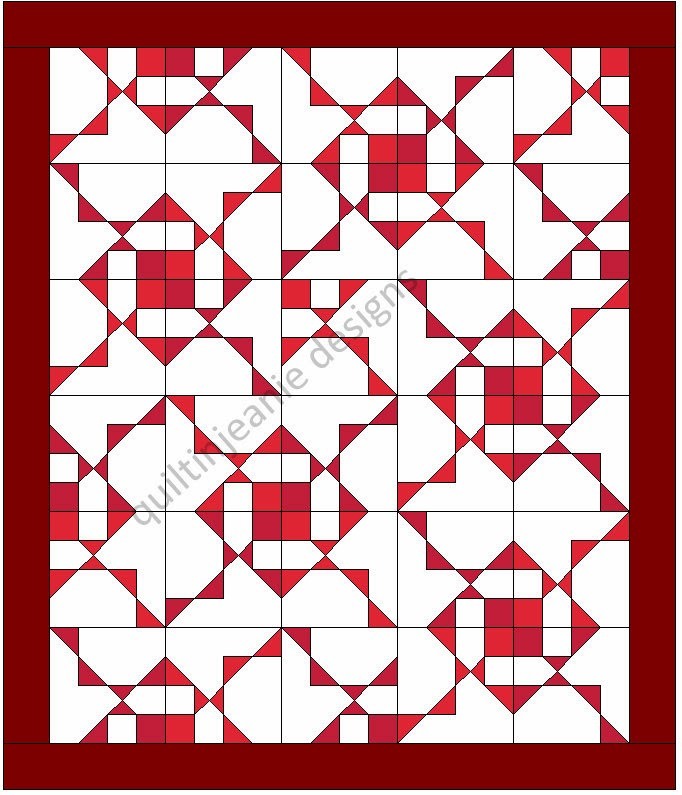 I'm not sure why I don't use red as much as other colors, but maybe making this quilt will encourage me to use it more! I started out playing around with several blocks I drew in EQ6. I purposely drew an odd block, one that didn't look that exciting as one, but would become more interesting when putting 2 - 4 of them together. That's the great thing about having a design program like EQ...you can draw it, redraw it, color it, turn it and play with it until you like it. I won't post all the layouts I came up with for different versions of this block, but this was the first one I really liked. I liked the way there was beauty in the randomness of the finished squares as well as a lightness to the design as a whole. For the first design, I used three different red fabrics. White: 4.25 yd. Red 1: .75 yd, Red 2: .75 yd, Red 3: 1.5 yd. White: 4.25 yd, Red 1: .75 yd, Red 2: .625 yd, Red 3: .25 yd. Red 4: 1.5 yd. So I redrew the block and used the same setting to come up with this design. I'm still torn between the last two, as I like them both. I like that the 3rd version has a more definite line, but still like the 2nd one too. This design uses 4 different reds as well. White: 4 yd, Red 1: 2.25 yd, Red 2: .25 yd, Red 3: .25 yd, Red 4: .75 yd. Now I'm excited about making this quilt for the Make It Challenge, which begins next week, and have been choosing fabrics! There are a lot of pretty reds out there, as well as a lot of different red tones, so I'm not sure I will be able to limit myself to three or four reds! You can participate in the Make It Challenge even if you didn't design your own quilt...there are two categories to this portion of the challenge. 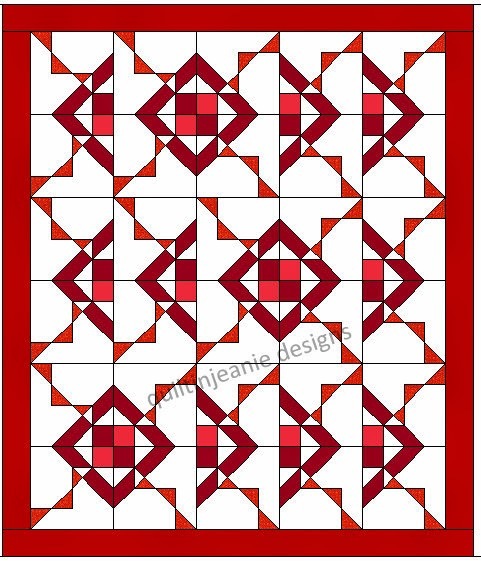 You can make your own design, or you can make a quilt using a purchased or free pattern. There will be virtual quilt shows of each category of "made" quilts. There are also prizes to win along the way. All quilts have to be made in 2014 to qualify for the challenge. Which one do you like best? I'd love to hear your opinion and why! Your quilt will be beautiful, I have the photo of all the red and white quilts hung in American Fold Museum in Manhattan it is amazing. Hey, way to go. I like the third option. Why, I don't realy know. But just looking at them all I like the third best. This is an interesting block - good idea to design one so that the secondary patterns appear. I think I like the third quilt version best as it has more definition. Jean, I like the third one best. So cool. To me it appears lot have depth. My first reaction was a hall of mirrors. Really like this and can't wait to see quilt from your pattern. Happy piecing and quilting!